At an All-Staff meeting, GSCSNJ had the chance to hear from Eileen Dolye, Vice President of Program from GSUSA. 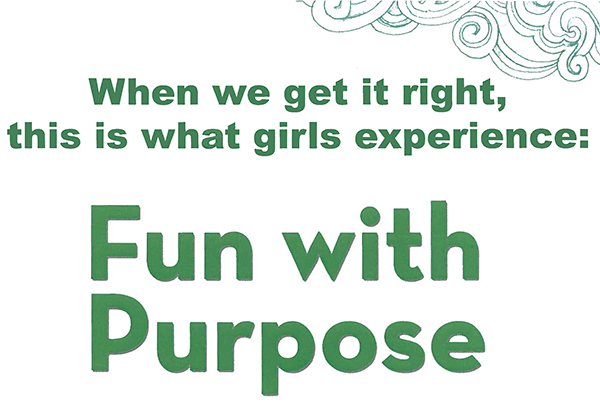 She spoke about Journeys to help us get ready and refreshed for the upcoming Girl Scout year. "Last week, I found myself chatting with a friend of a friend and her five-year-old daughter. I am so glad I happened to have a bunch of Flower Friend stickers in my bag. Why? Well, that’s a longer story for a different day…but you might want to tuck some Flower Friends in your bags too. Download them here. When I took them out, I thought the five-year-old would enjoy them—and she did. But here’s what I had not predicted: her mom instantly gravitated to them—reading the lines of the Girl Scout Law on the top of each. She is not a Girl Scout and never was and did not know that these were the lines of our Law. However, she loved what they were saying to her daughter: Be Honest and Fair…Be Responsible For What You Say and Do…Respect Authority….Really, what parent would not want their child to understand—and live—the Girl Scout Law? Here’s what my new mom friend decided to do—on the spot and without any guidance or background explanation from me: gather the Flower Friends stickers all together, punch a hole in them, put them on a little key ring to keep handy for talking to her daughter about how to act!" 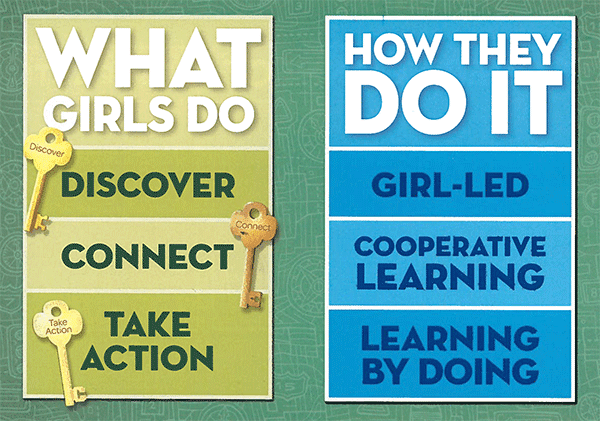 We focused in on how the Girl Scout Leadership Experience matches our mission to help all girls reach their dreams. The outcome should be that girls are given the skills to have courage, confidence and character, to where they can give to change the world around them. How do girls achieve this? The most misunderstood part of this is that girls discover self. They do this by learning who they are, trying new things, knowing what they stand for, seeking new challenges (academically) and so much more. We have the tools, which is our journey books to make this happen. The project is not the project, the GIRL is the project. We need to change our thinking and remember as leaders that everything is girl led. What does that mean? It means that adults will start off the conversation and ideas, but they will let the girls take over from there. The key points are to take it, start it and see where it goes. You'll be surprised how much the girls want to participate and can do things on her own. A journey isn't about the book, it's about the girl and she needs her imagination turned on. It's important to read it and then put down the book. See what the girls think and customize her journey to fit her needs. Why? Every girl needs this leadership experience in her life. She will be ahead of her peers and successful in the world. We had the privilege of having our board chair Ann Marie Horner in attendance. She said, "Eileen was right on par with what our council needs. 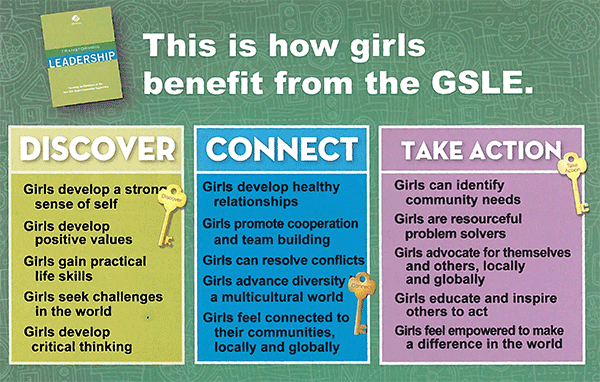 Every girl needs the chance and opportunity to gain these skills. We need our leaders to continue to use the journeys. We want our girls to be the very best."